How will Asus' big 17" F70SL laptop fare? We're increasingly seeing laptop manufacturers releasing high-end multimedia systems, spurred on by the introduction of the 16:9 widescreen laptop panel. 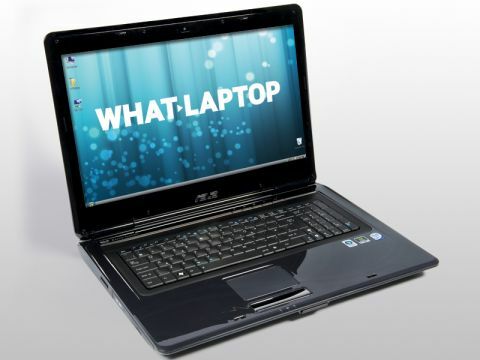 Asus is the latest to follow suit with its F70SL media centre (£859 inc. VAT) – the world's first 17.3-inch laptop. The extra size over standard 17-inch machines helps to make the F70SL perfect for movie playback, the 16:9 aspect ratio reducing the annoying black bars on the top and bottom of your films. Billed as a full HD 1080p machine, we were slightly disappointed by our review sample's 1600 x 900-pixel resolution – it provides clear image quality, but not the pin-sharp reproduction found on some of its rivals. The screen size also hinders portability, meaning the 3.8kg laptop is more suited to desktop use than travel. Films play back smoothly and without trouble, thanks to the use of a dedicated Nvidia GeForce 9300M GS graphics card, but it's a shame a more powerful GPU hasn't been fitted in a machine of this size. Nevertheless, it's powerful enough for media tasks such as photo editing and the 512MB of dedicated video memory means basic games should run smoothly. Build quality is impressive with the shiny plastics used being tougher than the average laptop – although the tribal pattern design won't be to everyone's taste – and there's no sign of flex or movement from the large screen as you type. The keyboard is spacious and comfortable to type on, with large, flat and responsive keys. The huge touchpad also offers precise control. The combination of an Intel Core 2 Duo processor and 4096MB of memory means that the laptop has no problem running office applications such as word processing and data spreadsheets, and multi-tasking is easy. The very large screen means that working with multiple windows open is always comfortable. Connectivity is good, with 802.11n Wi-Fi, and Gigabit Ethernet provided – the most advanced technologies currently available, ensuring fast network access. Four USB ports offer connections to a variety of peripherals and there are both VGA and HDMI-out for connecting the laptop up to analogue and digital external monitors. However, at this price, we would expect to see an eSATA or FireWire port included for fast data transfer to external devices. While it certainly isn't the portable powerhouse we would have liked, due to the lack of a top-end GPU and a disappointingly average screen resolution, the F70SL has its merits in build quality and comfort and is certainly worth a look for those after an affordable multimedia desktop replacement.